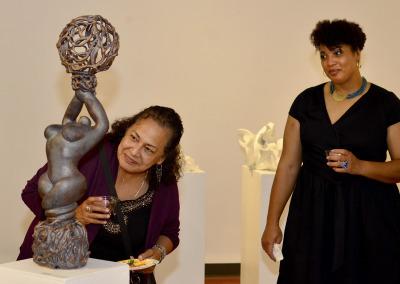 The third annual fines art student exhibition included artists ranging from graphic designers, tattoo artists, to ceramic sculptors, painters and photographers that flooded to the Carmen Castellano Art Gallery from April 13-29. The students who took Jason Adkins, an SJCC art instructor’s Art 76 portfolio preparation class have learned how to set their art in a professional way. [media-credit id=1 align=”alignright” width=”400″] [/media-credit]Lucy Ghelf, a professional artist said that she had six ceramic pieces on display that were Bas Relief, and two white sculptures. Another artist named Andrea Brown, a SJCC student had set up three pieces of her artwork in a professional way at the art exhibit. “Its high fire ceramics and they chronicle my experience as I learned about my own culture and history as an American,” Brown said. Some students had a good experience working with other student artists that were at the art exhibit. “The Eclectic Perspective Exhibit is a good opportunity and experience for every student to show their work to the community campus, “Andy Nguyen, a SJCC student wrote in an email.